Submitted by Quell on May 17, 2008 - 1:33am. It's not true, Houston's just also known as Hell. 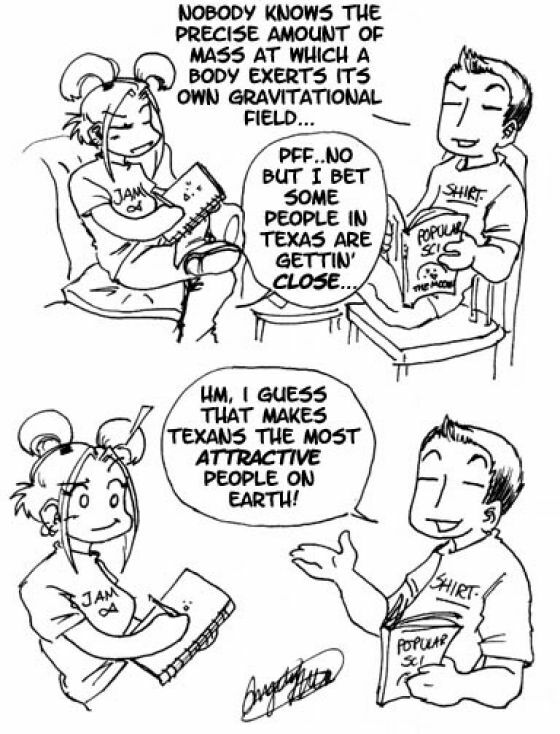 It doesn't even count as Texas. Or a city. Or a locale. It's just...hell on earth. Submitted by Dust Manchoo on May 18, 2008 - 10:36am. Houston is STILL pretty damn fat. Submitted by Chiomi on May 18, 2008 - 4:33pm. It's because, as the article says, Seattle is in love with espresso as opposed to Big Macs, like Houston. Submitted by TheBravery on June 19, 2008 - 12:05pm. I don't get his point. Any mass exerts it's own gravitational field. It really feels like I'm making a mean or silly comment, when I actually fell in love with this comic.. Submitted by moonstarsfire on September 22, 2008 - 7:18pm. There aren't even that many McDonald's in actual Houston. I can think of about 2. Submitted by mykalwane on April 30, 2009 - 4:37pm. I may be wrong here, I am an idiot after all. The more mass one determines, the more the dense the object is basically. Though it isn't Big Macs that are the problem, it is things like bacon wrapped steaks. Things combined to be awesome are easily obtainable. The coffee shop I go to sells French Toast sandwich with sausage, cheese and egg between the two French Toast with syrup to dip them in. They also sell cookie sandwiches of two chocolate chip cookies with cake frosting and sprinkles. You can see how things are bigger in Texas. Submitted by miasaki666 on August 28, 2010 - 1:10pm. Submitted by Amake on December 10, 2013 - 6:44am. I guess earthbound engineering doesn't have much to do with microgravities on the scale of people and such. . .?